20 Most Beautiful Sakura Flower View Places in Japan - Japan is often used as a tourist location for some people from outside Japan, including tourists from Indonesia. And one of Japan's most anticipated features is the spring where the cherry blossoms will bloom. The cherry blossoms are indeed very charming and provide a typical Japanese atmosphere. If you want to visit Japan in spring, here are some places to see the most beautiful cherry blossoms in Japan that can be an alternative tourist destination. Arashiyama is one of the areas in Saikyo, Kyoto, which is quite popular as a tourist attraction. There are also many interesting cherry trees when spring arrives. The best spot to enjoy the view of cherry blossoms and other flowers at bloom is at Togetsu-Kyo Bridge. From there, the pink and green scenery will blend from the existing trees. In addition, Arashiyama area is a strategic location for travel, because there are many facilities that are easy to find, such as souvenir shops, temples, or where to eat. So this location is suitable for shopping tour as well. 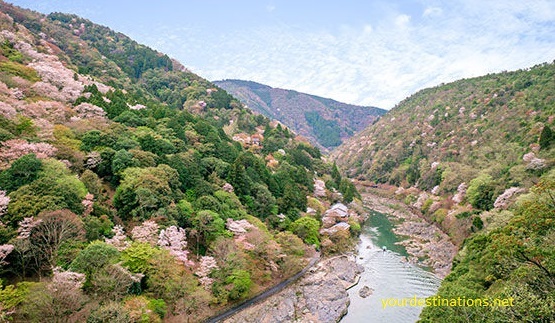 Lokasi: Saikyo, Kyoto Best time to see: Mid-March - mid April So are some places to enjoy the scenery of the most beautiful cherry blossoms in Japan in spring. The cherry blossoms are indeed a charming Japanese icon. If you go to Japan in the spring, do not forget to prepare all the necessary things. May be useful.